An easement can be created by an express easement, by implication, or by prescription. An express easement is clearly stated in a contract, deed, or will. An easement by implication occurs when the owner of a piece of land divides such land into smaller pieces and sells a smaller piece to another person, retaining a right to enter such piece of land. An easement by prescription arises through an individual's continued use of land as opposed to the possession thereof. A solar easement may be granted and conveyed in the same manner and with the same effect as a conveyance of an interest in real property in this state ( 34-40-2). In a conveyance of real estate in Rhode Island, all rights, privileges, and appurtenances belonging or appertaining to the granted estate shall be included in the conveyance, unless a different intention clearly appears in the deed ( 34-11-28). The easement deed creating the rights of usage should specify the terms and conditions of the easement. 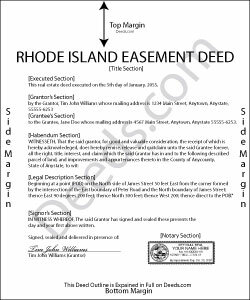 An easement deed in Rhode Island is required to be in writing, duly signed, acknowledged, delivered, and recorded in the town or city where the property subject to the easement is located ( 34-11-1). A duly signed and delivered easement deed will be operative to convey to the grantee all the possession, estate, title, and interest, claim, demand, or right of entry or action of the grantor in and to the easement conveyed ( 34-11-4). An easement deed can be acknowledged before a state senator, any state representative, judge, justice of the peace, clerk or assistant clerk of the superior court, mayor, notary public, town clerk, or recorder of deeds ( 34-12-2). Rhode Island does not require a set form for acknowledgements, but it should be made by all the parties executing the instrument and should also be accompanied by a certificate of acknowledgment. Acknowledgments taken in other states will be valid in Rhode Island ( 34-12-1). A duly acknowledged and recorded easement deed will be deemed constructive notice and operative as against third parties in Rhode Island ( 34-11-4). A real estate deed that has been delivered but not recorded will be valid and binding between the parties and their heirs, and as against those taking by gift or devise, or those having notice thereof, even though the easement deed has not been acknowledged or recorded ( 34-11-1).